19-Mar-2011 -- We got off a bit late from Chiangmai, but when we reached Mae Hong Son we decided to make an exploratory visit to the confluence point area. At the village Huay Pong, about 35 km south of Mae Hong Son, we found a road heading in the right direction. A few kilometers along the road we came to a small village and a “gate” to a national park. The GPS indicated a distance of around 2.5 km to the c.p. The man at the gate said that the road onwards was mainly concrete for the next 2 – 3 km, but from there on very bad. It turned out to be a very steep climb with many hairpin curves. But with very spectacular views. When the concrete road ended, the road continued with gravel and mud. Fortunately it was all very dry, otherwise we would never have made it. We stopped at a place about 600 m from the c.p., found a place to park the car in a way that would allow others to pass on the narrow track and looked down the extremely steep slope in the direction of the c.p.. It was early afternoon, we would have three – four hours before dark and decided to go for it. It was not easy, the decent was probably at 45 degrees, the ground was loose gravel, soil and most problematic, big dry teak leaves which made it difficult to see were to safely put your feet. We cut a couple of bamboo walking stick, enjoyed the smell of freshly cut bamboo, and set off down the hill. The big trees gave some shade from the sun. It turned out to be a much slower decent that expected due to the gradient. It took us more than two hours to get down the slope to the bottom of a valley with a small stream. And that brought us only 200 meters closer to the confluence point. We followed the stream in the direction of the confluence point, found a foot path and after another hour had the c.p. up the hill again, at a distance of about two hundred meters. By then I was so tired that I decided to settle for a GPS reading within 100 m. But Peh would not give up and more or less pulled me up to a point where the best reading we could get was 9 m. The slope was steep and it was difficult to stand firm. By then we realized we had no chance of getting back to the car before dark, and we had no torch. So we hurried down to the path again, heading down the valley in the hope of finding a village or a road. The night caught us quickly and the speed was slow. The swarms of accompanying fireflies did not help much. Nor did the full moon, the largest for 20 years, due to the big trees around us. Finally we reached a village, the one near the gate to the park. We met the teacher of the local school who had a motor bike. He took me up to the car again. He had a reasonably big motorcycle, but in the steepest parts I had to get off. Back at the car I checked the GPS again and saw that the decent had been more than 200 m.
Peh was an excellent guide and a good support. She grew up in these border areas between Thailand and Burma and was used to this kind of terrain and vegetation and was a great source of information. As a child she went out in the forest before sunrise to collect big leaves which she brought back to the village and put together to units which were used as roofing on their buildings. And still is in most villages in the area. She pointed out the various trees, plants, flowers and described the traditional life in a Karen village. And answered lots of, probably stupid, questions, always with a positive smile. Without her I could not have reached this confluence point. Back in Chiangmai I read the report of the first visitors once more and saw that we had really taken the most difficult approach which at places were risky hazardous. #7: Peh at her first confluence point. 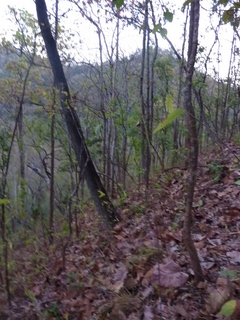 In the Namtok Mae Surin National Park.